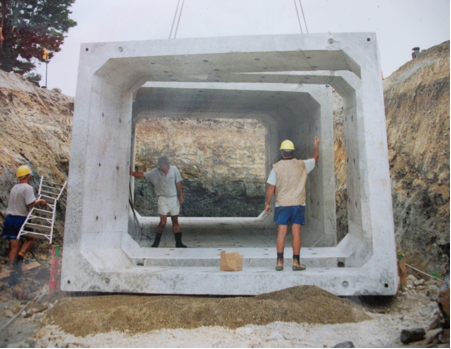 Absolute Concrete manufactures a range of reinforced precast concrete Stonetraps. The largest one piece unit has been designed with a 2.2 metre entry to enable the wider tractor / loader buckets to clean with ease. The stonetrap is designed to allow time for stones and gravel to settle out and ultimately reduce the wear and tear on your effluent pumps. 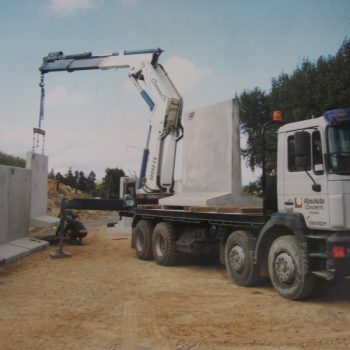 Available as a drive through or wedge shaped which comes in mini, standard or maxi, Precast Stonetraps produced by Absolute Concrete have been designed to intercept stones, sand and debris. They are easily and conveniently cleaned with a tractor or loader bucket. They are sloped to keep the heavy stuff near the bottom and provide a sound, functional and permanent structure. Knock out soft spots allow for easy and tidy pipe connections. Pre cast Stonetraps are designed as an easy to clean farm effluent settling device however periodic cleaning is essential to ensure the stonetrap works effectively. The large size of the stone trap means that the velocity of incoming washdown water is slowed down and allows more time for stones and gravel to settle out. All precast stonetraps in one piece or for onsite assembly manufactured by Absolute Concrete are produced in accordance with NZS.3109:1997. With surface finishes to NZS 3114:1987. 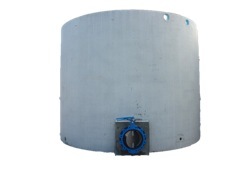 They are manufactured in 40MPa concrete and 500 grade galvanised steel for high durability.